First take your cake (either one you make your self or just buy one) Even out the top and flip it upside down and secure to the cakeboard with a sausage of Almond Icing. Fill in any holes in the top (previously bottom) of your cake with some almond icing and a butter knife. Spread slightly melted Apricot Jam all over your cake so that the Almond Paste is able to stick! Knead your packet of Almond Icing until its soft enough for you to roll out with a rolling pin. Dust your bench with some Pure Icing Sugar so that it doesnt stick too much. Roll the icing out until it'll fit over the top and down the sides of your cake. Cut off the excess icing and smooth out the surface and get rid of any air bubbles. 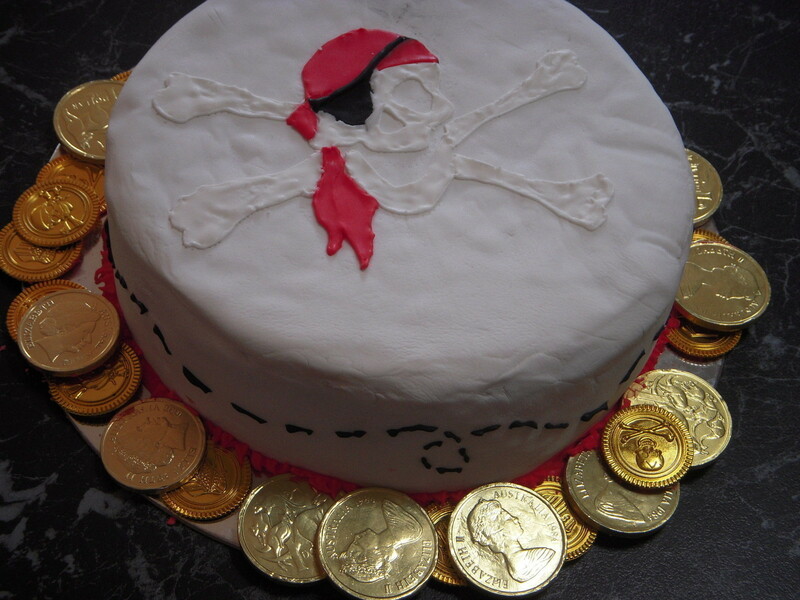 Wait a day or two (or a week like me) until the icing is nice and hard. Repeat the last few steps except this time using the white icing. Draw your scull and crossbones design on to a peice of greaseproof paper and rest it on top of the cake. Take a pin and prick lots of little dots into the icing so you can see where to ice next time. Wait a few more days for this to dry. Now you're up to the fun part! :) Decorating! Make up some royal icing. 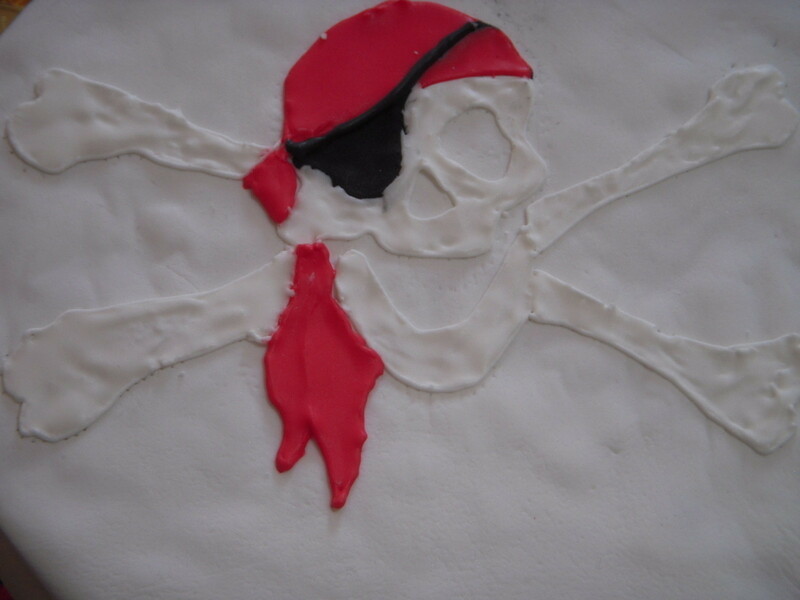 Mix up some red, off white and black icing. 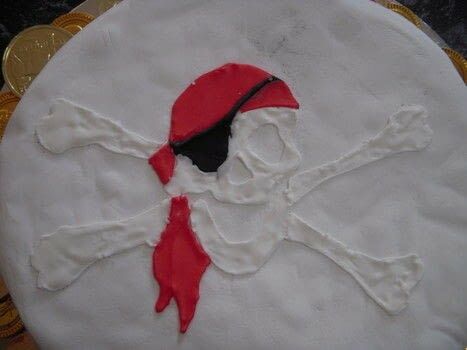 Fill piping bags with regular round tips and begin by piping the eyepatch, then bones and then bandana.. I think.. maybe it doesnt matter? 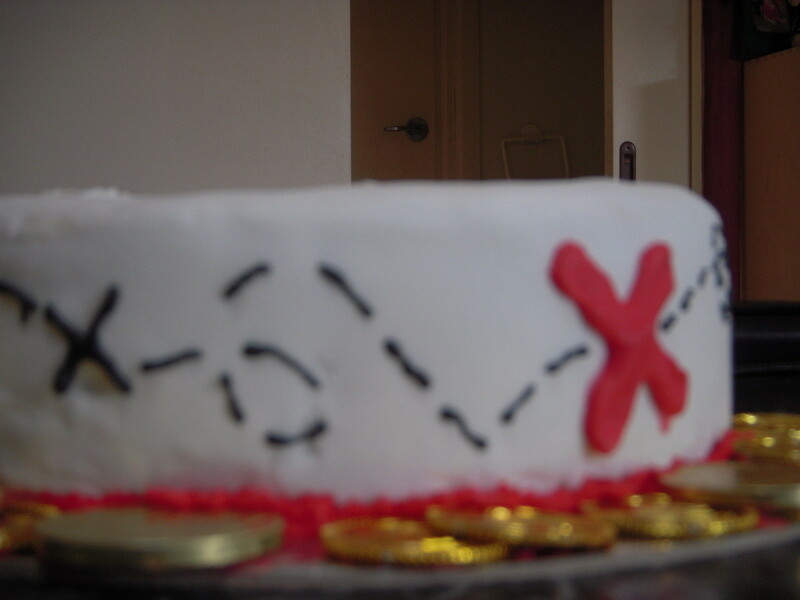 On the side of the cake do a big thick red cross (might need to change tip) and then draw a black trail all around the edge of the cake. 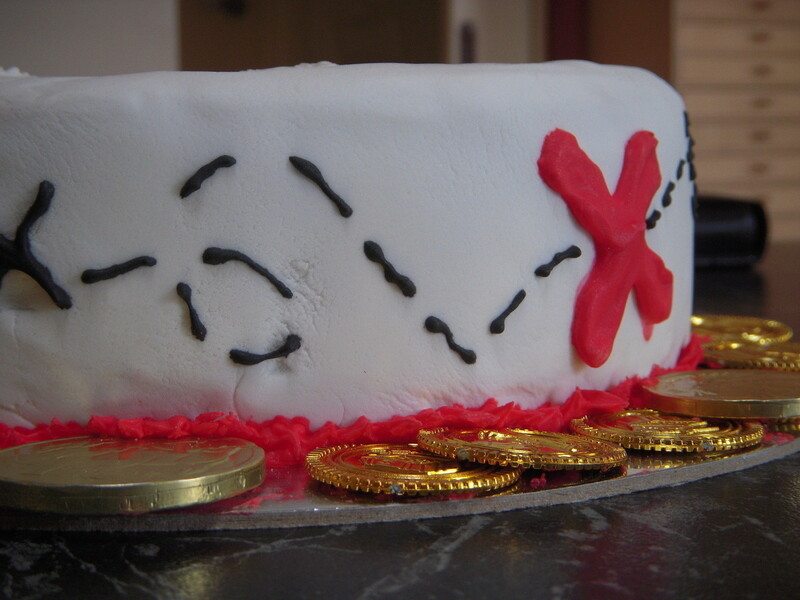 Take your red icing and a star tip and pipe little stars all around the bottom edge of your cake. You might want to practice on a plate or something first! Thin out all of these icings then flood the areas im between on the skull. You might need to use a squewer to push it into the corners. 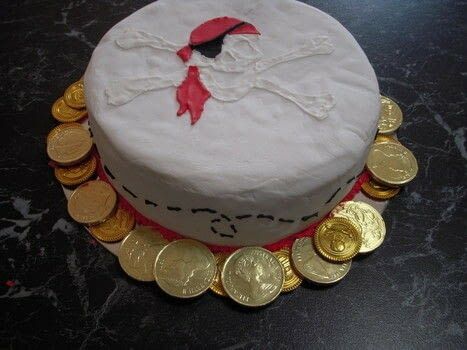 Now if you want you can decorate the cake board by taking some chocolate coins and i also used plastic pirate coins and just secure them around the cake with a bit of royal icing!